Whether you operate a convenience store, grocery store, pharmacy, or hardware shop, you want to make shopping carts available for your customers. Ideally, these carts let customers shop at their own pace, picking up more items as they browse thanks to the space and mobility afforded by the cart. However, not all shopping carts are created equal. And for some businesses, these carts become more of a liability than an asset. Size: Too Big, Too Small, or Just Right? When it comes to choosing the right shopping carts for your business, you have to strike a balance in terms of size. On the one hand, you want carts large enough to encourage customers to fill them up with as many items as they deem necessary. On the other hand, carts that are too large can lead to spatial problems, especially in smaller stores. This doesn’t necessarily mean you should only purchase medium-sized shopping carts, however. Instead, you must consider the specific needs of your storefront. How large is your store? How wide are the aisles? How much storage space do you have inside the store and in the parking lot? What is the average size of purchased items at your business? And how many customers typically fill the store at a given time? After you’ve taken all of this information into account, you can make an informed decision about the ideal size and amount of carts for your store. Your business cannot thrive without loyal, happy customers. To keep them coming back, you want to offer as frictionless an experience as possible. They should be able to walk in, grab a cart or basket, and easily navigate each aisle without running into obstacles or other customers. The carts and shopping baskets you implement play a major role in every customer’s experience. For one thing, if there aren’t enough carts available, customers will become quickly frustrated and either leave or purchase fewer items. 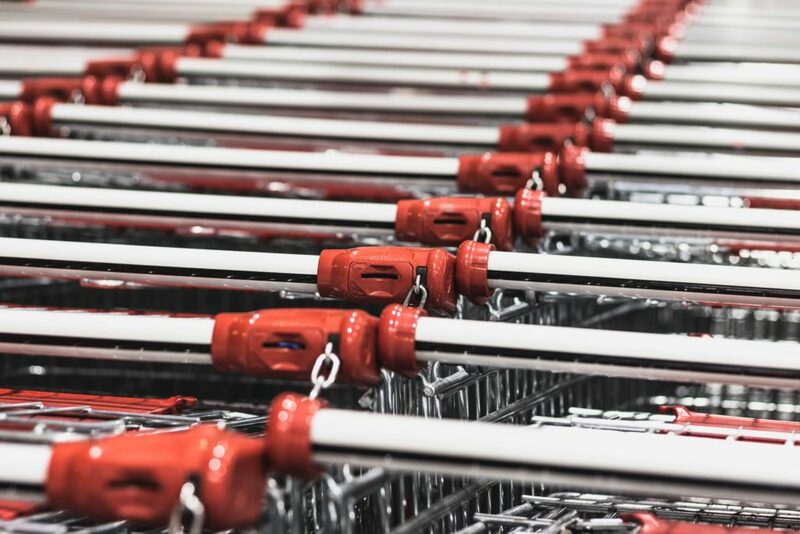 If carts are too large for your store’s aisles, customers may run into displays or other shoppers, or have to redirect their path to avoid such issues. Conversely, baskets that are too small or heavy make it difficult to carry heavier or larger items. Damaged and old shopping carts don’t just hurt the image of your store, they can also lead to mobility issues if wheels are missing or jammed, handles are broken, etc. There are many ways to make your customers happy. Providing them with better shopping carts and baskets is one of the most significant. Even if your shopping carts don’t look ugly or outdated, they could always look better and serve your company better as well. To maintain the brand and image of your business, it’s wise to invest in shopping carts and baskets that allow you to stamp your logo and/or name on them. At the very least, you’ll always know which carts belong to you. But beyond this, unique shopping carts will enhance brand recognition for shoppers and potential customers alike. It’s a great way to bring your store together and develop an exclusive atmosphere. You can further customize your new carts and baskets by choosing specific colors. Perhaps you want these items to match the colors of your logo. Or, you could purchase carts and baskets of varying colors to more easily distinguish them by size, making it easier for customers to select the right receptacle. Whatever the case, customizing the appearance of your shopping carts and baskets can make a big difference. Do you know where your old carts came from? To ensure the continued success of your store, you’ll want to find a reliable cart manufacturer. In recent years there has been a push to be more locally-minded. Buying products manufactured in the USA is smart for a number of reasons. For one thing, it puts more money into the community in which the product is made. That money remains in the U.S. economy and in some ways will make its way back to you. Additionally, it’s often cheaper to buy U.S. goods because there aren’t added import costs or exorbitant shipping fees. So, Should You Replace Them? Many of us might not think too much about the shopping carts and baskets we use on a regular basis. However, we certainly take notice when we use one that’s too big, too small, broken, or outdated. These negative experiences tend to loom larger than all the positive ones combined. As a store owner, you want to eliminate the possibility of these bad experiences. Replacing your shopping carts is a good place to start, especially if you aren’t meeting all the standards in this checklist.